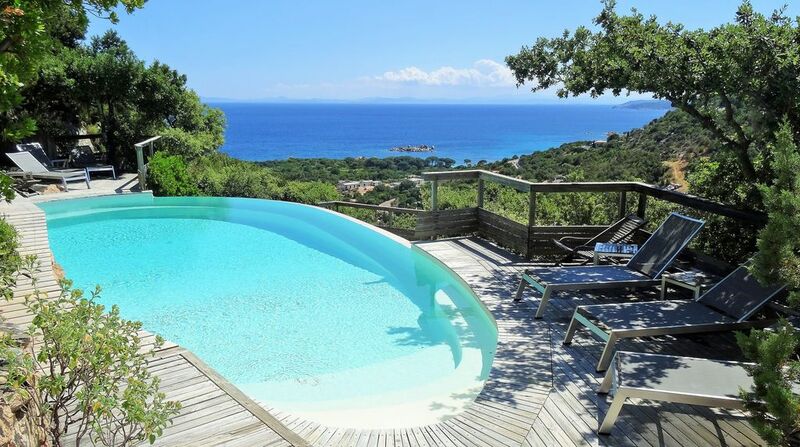 Palombaggia Beach: House, 5 stars, panoramic sea view, Pool. House at Palombaggia, 2 bedrooms, 2 bathrooms, panoramic sea view and pool. Bookings are accepted only from saturday to saturday- Otherwise booking won´t be accepted. On wooded ground of 5000 m2 with 2 houses in real countryside. Panoramic sea view and Sardenian coste. Ideally located, at 700m of the beachs of Palombaggia, Folaca and Acciaro. It consists of 2 doubles bedrooms (1 double bed and 2 single beds), 2 complete bathroom, 2 WC, Living room with T.V opening on large terrace whith outside furnitures and barbecue, equipped kitchen with washer machine, fridge, coffee pot. The swimming pool, in a narural landscaping, is shared with 3 other lodgings. Very peaceful, all facilities, choice furniture, , recent building. FREE WIFI. TO RESERVE: thank you to communicate your postal address to me and a mobile phone number, so that I prepare you and sends a leasing agreement to you. We spent a wonderful week, we had everything we wanted. Conrad was there to help us for any need.The terrace has a fantastic view that you want to spend whole day. We did BQ with Fresh fish several times with a good local wine. We will come back next year!! "This is an absolutely beautiful place to stay. it has wonderful views of mountain and sea, is very private and quiet, tastefully and comfortably furnished and the owner was extremely helpful, welcoming and friendly. We fell in love with it and will definitely stay there again." "The view from the deck was to die for. A magnificent location. Surroundings extremely quiet. It was a very hot time of the year and the only improvement could be some fans in the bedrooms at night to cool it down a bit." "This is a unique holiday apartment, very well designed in contemporary style and constructed with good quality fittings and just about everthing you will require. The terrace has a superb view. The swimming pool is excellent. Owner very helpful and attentive when needed. Just about perfect. Only note that the balustrade was not complete when we stayed in June 2004 and would be dangerous for small children." Das Haus hält genau was die Fotos versprechen (was eher selten ist). Wir haben unsere Herbstferien mit zwei Kindern (9/7) hier verbracht und extrem genossen. Das Haus und der Pool sind sehr schön, sehr gepflegt und bieten alles was man braucht. Der Vermieter ist sehr nett und zuvorkommend. Er gab uns viele Tipps für Ausflüge, Sehenswürdigkeiten und schöne Strände abseits der Masse. Will man mit dem Auto zum Strand hat man da eine zusätzliche Parkmöglichkeit. Man kann aber auch mit Kindern in 10 Minuten zum sehr schönen Strand laufen. Das Haus ist eine absolute Empfehlung und der Blick von der Terrasse aber auch von den Zimmer aus ist hammermässig. Airports : FIRARI SUD CORSE at 20 KM, BASTIA at 2h15, AJACCIO at 2h45 and Calvi at 3h45. Le ménage de fin de séjour est de 75€. Remise des clés par le propriétaire sur place. UNE CAUTION DE 800 EUROS SERA DEMANDEE A L'ARRIVEE ET REMBOURSEE AU DEPART. Les animaux ne sont pas admis.